The murders of unarmed African-American people at the hands of police officers has created a lot of reasonable doubt in our criminal justice system. OpenJustice, an interactive web platform developed by the California Department of Justice and spearheaded by the office of the attorney general, has today released a new set of criminal justice data for the sake of transparency and accountability. It includes data from California’s 1,000-plus law enforcement agencies to allow for side-by-side comparison of agencies, like San Francisco Police Department versus Los Angeles Police Department. The new local data also includes information on the demographic information of both victims and offenders. The first version of OpenJustice, which launched in September 2015, included only statewide data on arrest rates, death in custody and arrest-related deaths, and law enforcement officers killed or assaulted. It was not possible to break down that data by specific law enforcement agencies. In OpenJustice 2.0, it is. 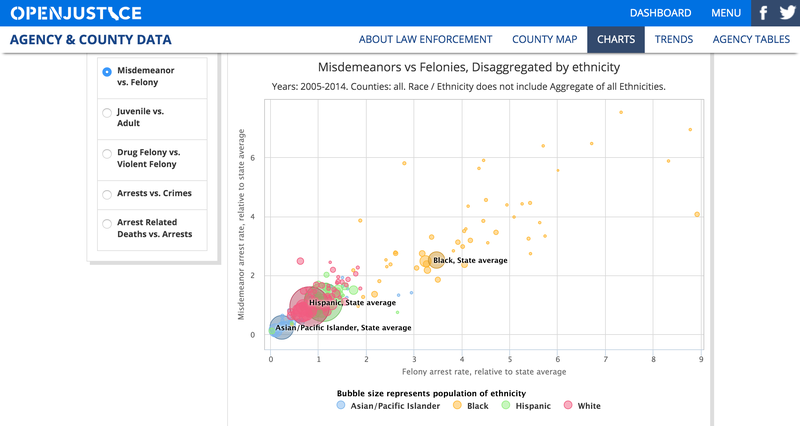 The new version also features data on “clearances” in order to show how law enforcement addresses crimes (a clearance is when law enforcement makes an arrest or charges someone with a crime). In the new data, some takeaways are that crime is dropping overall, violent crime and property crime are at an all-time low, and homicide rates are down. It also exposes racial inequities in California arrests. While the OpenJustice team noticed striking disparities between the state population versus the arrest population in statewide data, the team was able to get even more granular in version two. For example, African-Americans across almost all California counties are continuing to be arrested at significantly higher rates than other races in those counties. The data also shows that African-Americans across those counties comprise a higher percentage of the arrest population than the general resident population in those counties, and a higher percentage than the African-American population statewide. Sigh. The other reasons for doing this are about informing people, improving our criminal justice process and enabling the public to get a better sense of how big certain problems are — such as deaths in police custody — in the criminal justice system, Erlich says. OpenJustice also hopes that “the public will start to feel that there is a renewed attempt to build and strengthen the trust between law enforcement and the public they’ve sworn to protect,” Erlich says. By empowering the public with this data and making it easy to explore and understand, the public should feel more equipped to know what to ask for from policymakers and legislators. With the growth of data science and technology, and through OpenJustice, there is also an opportunity to identify areas where law enforcement agencies can try new interventions to improve public safety. And since OpenJustice is open source, other law enforcement agencies nationwide can join the California DOJ in its own transparency efforts. OpenJustice has also partnered with the White House to try to create a model that other states can replicate, Erlich says. The OpenJustice team — which includes anywhere from six to 20 people, since this is not a full-time job for anyone — ultimately wants others to be able to stand on its shoulders and continue building on top of it. In the last six months, OpenJustice has unveiled two versions of its platform and it’s not close to being done. OpenJustice wants to focus on different parts of the criminal justice system. Next, the team will focus on juveniles and conduct a deep data dive around the school-to-prison pipeline. Then it will be the court system and compiling data around court prosecutions. The roadmap also includes exploring data around incarcerations and better understanding of what goes on in jails and state prisons, as well as ending the vicious cycle of recidivism, which involves returning to prison following being released. That roadmap, which also includes hackathons with designers and video artists at Stanford and engineers at Facebook, should take about six to nine months to complete.